Drafts 5.10 (iOS) is now available in the App Store, details below. OneNote action step. Similar to Evernote action step. Allows creating, appending, prepending to pages in Microsoft’s OneNote service. OneNote integration guide on the community forum. OneNote Action Step Docs, including links to sample actions. Drafts has always had a somewhat hidden convenience feature when you tap and hold the “+” new draft button. 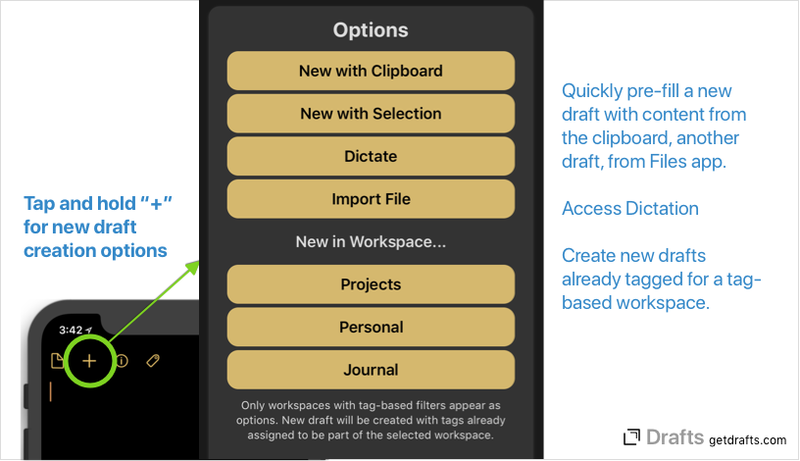 This menu allows for a number of new draft options, and now also has “New in Workspace…” options. Any workspaces you have created which are based on tag-filters will appear here as options and using these options creates a new draft already assigned the tags needed to place that draft in the workspace. New: Visibility of action groups in the action list can now be configured like visibility as a keyboard. If the group is not “available in list”, it will not be displayed in group select sidebar or quick access tabs in action list. If a group is not available in either the list or keyboard, it can still be accessed/edited in “Manage” view. Change: Some improvements to error messages from failed Dropbox actions. Fix: Separators not displayed properly when using Operations > Run Action from draft list. Change: Updates default action sets.